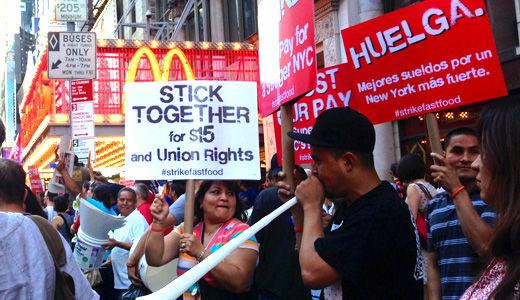 NEW YORK CITY – Hundreds flooded Times Square Sept. 4 in response to the fast food workers’ demand for $15 and a union. 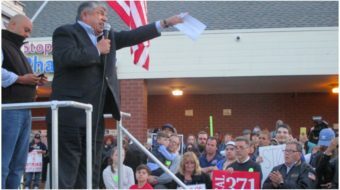 Imams, rabbis and ministers, together with local union presidents, stood in the front of a long line of community supporters. With the rallying cry, “whatever it takes,” many of the members of Fast Food Forward, which called the demonstration, prepared to engage in civil disobedience. As they marched through central Manhattan on their way to Times Square the workers received many thumbs-up and other gestures of support. “All the way,” he shouted. The message of the demonstrators was that they are prepared to do whatever it takes to win respect and a living wage, $15 and a union. Amber Graham was fired from her job at Burger King on Marcy Ave. in Brooklyn in an act of retaliation for her union organizing activity, many of her co-workers say. The manager at that Burger King claims she was terminated for “stealing electricity” — charging her cell phone. Graham now works at a Stop and Shop Supermarket where she is a member of the United Food and Commercial Workers Union and is protected by a union contract. “I don’t want the people who came up after me to go through what I did,” she said, when asked to explain why she was out rallying for fast food workers early in the morning even though she now has a different job. Make The Road, New York Communities for Change and hundreds of union members, clergy and supporters chanted “15 and a Union,” to the beat of the drummers. “Our movement is growing and we won’t stop till we’ve won,” they said. As news stories and statistics come out just about every day regarding the disparity of wealth and the widening gap between the 1 percent and the rest of the population, it is getting increasingly difficult to defend a minimum wage in New York of just $8 per hour. The poverty rate rose to 21.2 percent in 2012, from 20.9 percent the year before, and is even higher today, meaning that more than 1.7 million New Yorkers fell below the official federal poverty threshold. Wall Street and the Dow Jones reach record highs, while low wageworkers struggle in conditions of poverty and inequality. Stories make front page news about single parents working two and sometimes three jobs to pay rent and feed their families while the “CEO of McDonalds and Starbucks earn $9,200 dollars an hour,” according to Business Insider. Naquasia was one of several workers who sat down at 55TH and 8TH avenue intersection where they stopped traffic and were arrested. As the arrests took place the crowds broke out into songs of freedom and non-violent resistance. 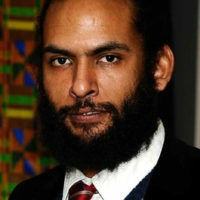 Estevan Bassett-Nembhard is the New York City organizer of the Communist Party USA. 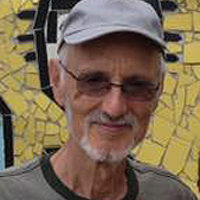 He has led community campaigns for the Black Radical Congress, the Young Communist League and La Fuente. He traveled the country helping health care workers form unions with the Service Employees International Union. He enjoys exploring NYC neighborhoods and parks with his family, friends and dog, Conan.